I am not a fan of eggplant. I have never enjoyed the texture or taste of it and so I was a little apprehensive to have it. Boy, I am glad I did. It was perfectly made and if there had been any kind of leftovers to take home, I think I would have fought for it. Cut off ends of eggplant and peel it…can leave a little bit of the peel on it. Slice in 1/2 inch slices. dip in flour, then dip in egg and cold water mixture, then dip in italian bread crumbs seasoned with basil, parley,salt and pepper, and garlic powder. Place breaded eggplant on a cookie sheet. Drizzle with olive oil on top and bake at 375 for 10 minutes till brown on bottom then turn and brown the other side…usually another ten minutes or so. 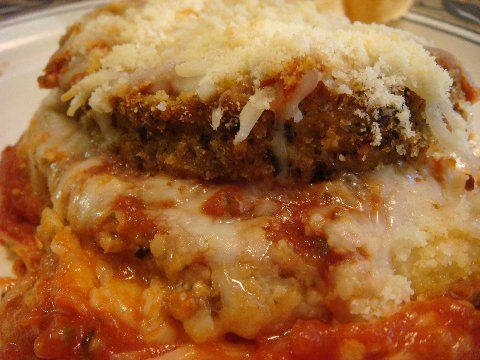 In casserole dish layer sauce, eggplant, sauce, shredded mozzarella, eggplant, a bit more sauce…a light covering this time, more mozzarella and parmesan cheese. bake 350 for 25 minutes. You can use a jar sauce or your own marinara sauce for this…of course I try to use my own if I have time. Drizzle olive oil on bottom of pan and add your chopped onions to it and cook till soft. Add garlic and cook on low a few more minutes, you don’t want the garlic to brown, then add everything else and simmer for about 2 hours uncovered. Stir occasionally and don’t burn. You can make this the day before you make your eggplant and just keep it in the fridge till the next day when you need it. Now on to the pasta. It was wonderful. If you have not had fresh made pasta, it is just such a treat. The bowl was huge and looked and smelled wonderful. It had such a smooth, clean taste. Yum! Brown garlic that has been chopped in oil. When brown let oil cool and remove garlic from oil and discard. Pour in clam juice and add spices. Boil for 3 minutes. Add clams and heat but do not boil. 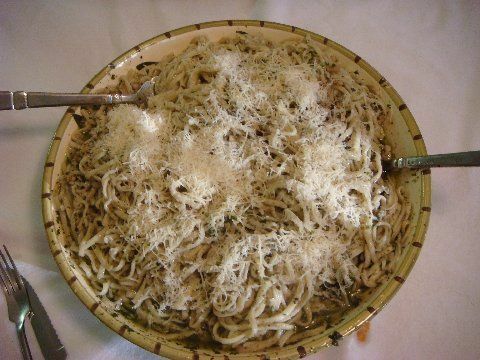 Pour over linguine and serve with grated cheese.